The Aeon is the Amarr supercarrier. With a 4% bonus to armor resistances per level allowing the Aeon to mount a tank upwards of 40 million EHP, the Aeon is immensly popular among null-sec and low-sec alliances. This, combined with its supportive capabilities make it a common sight in null-sec strike fleets. In huge capital brawls its immense tank makes it relatively unfavorable to engage versus other ships which do more damage or are more expensive vessels. 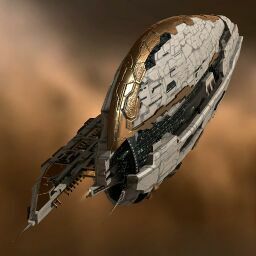 Like the Archon it is decisively inferior for a ratting carrier. Further information about additional or recommended skills to pilot Aeon for a specific or it's common role(s) can be written here. A 10000MN Afterburner (usually Enduring or Tech II) is also an option. Either a Warp Disruption Burst Projector, Stasis Webification Burst Projector or a Energy Neutralization Burst Projector are options. Use High Grade Slave implant set with the Slot 10 Hull Upgrades implant to match. 38.4M EHP with implants and no links. Can go higher with active armor hardeners but those are generally not used. 54M EHP with maximum strength Command Ship links. Always jump in full tank fit and refit after situation develops favorably to fit more Drone Damage Amplifiers. No sub-article about Aeon roles or piloting tactics. You can write them here. You can write additional notes for Aeon here. This page was last modified on 16 April 2018, at 10:34.